My movie viewing has been all over the map so far this year. That trend continues with one of the most beloved classic Disney films: LADY AND THE TRAMP. Liz and I were both fighting colds and we certainly needed something cheerful and uplifting. Besides, this blog is missing some of the great animated classics. Time to get on that. 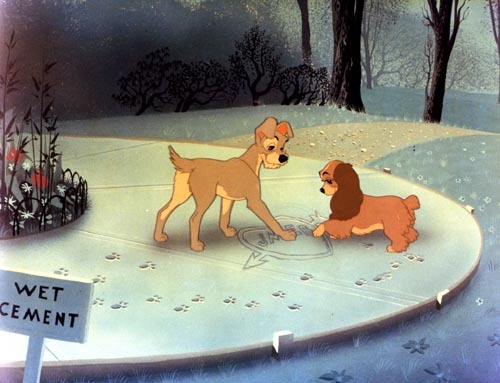 I watched LADY AND THE TRAMP (1955) on 1.9.12. I’m going to go ahead and say it was my first viewing of the film based on my self-imposed rule that it only counts if I saw it after I turned ten years old. I’m sure I saw this as a kid, and probably many times. Going into it last night, however, all I could remember at all was the spaghetti scene. Once the Siamese cats showed up, I smacked myself upside the head (metaphorically) for not remembering it. In fact, I could still sing all the words. I must have seen this many times as a little kid then. I just don’t remember 90% of it. The story involves an uptown female cocker spaniel, Lady, and a street-tough male mutt, Tramp. The boy falls for the girl and vice-versa. After a visiting aunt runs Lady out of the house, Lady clings to Tramp to help survive the streets. This is, of course, not really that dark of a film. But the plot certainly isn’t rosy. We see the world from a dog’s point of view. Despite the fear of being replaced in the heart of the owners by a new baby, Lady remains optimistic. The owners, in fact, turn out to not ignore her once the baby is in. It is not until they leave for a weekend, leaving lady with a mean old aunt and those damn cats, that Lady has to deal with real adversity. The dog perspective is nicely realized. The owners are known by the dogs as ‘Jim Dear’ and ‘Darling’ on account of their pet names for each other. Their faces are rarely seen, as the dog’s relation to a human is usually waist down. I can certainly ignore the fact that dogs can read English signs in a movie like this (I’m not that much of a cynic), so there are really no annoyances or truly kid-aimed facets of the film to be found. In fact, much of this is quite adult. There is one female dog who is clearly meant to be a prostitute. The rats are scary and vicious. A dog fight is pretty brutal. The original ending of the film, without ruining it for those who have never seen i, kills off one of the dogs in the final chase scene (which one should be pretty obvious to those who know the movie). When Walt Disney saw the film, he was shocked. He forced the animators to put the character into the last scene to ensure the survival of the character. Interestingly, this was shot in a 2.55:1 ratio, the widest widescreen animated film that Disney ever made. Everyone seeing this on VHS all those years were, truly, only seeing half of the film. The widescreen really allows for some wonderfully realized hand etched landscapes. There is some beautiful work drawn for this movie. I’m not sure I put this one in the category of the all-time great Disney films, but it certainly was refreshing to watch an old-school hand-drawn film with a great score and some solid voice acting work. I’m not a huge fan of any of the songs (except for those damned cats), but I don’t begrudge the movie for having them. If this one has passed you by, there are certainly much less enjoyable ways to spend 76 minutes. The bonus is for the orchestral score. It was so nice to hear a symphonic score backing up animated action. Perhaps it is an antiquated method, but it makes me smile. Also, a reminder that ACTING, in animated films, considers both the voice acting and the work of the animators in creating character. ~ by johnlink00 on January 10, 2013. It’s been so long since I’ve seen this I can’t remember how I feel about it…I’m thinking ambivalent…but I do love those cats! Yep. If asked to name my top 10 non-Pixar Disney movies, this MIGHT crack the list. Might not. Not spectacular, but it is a cute little movie.